My Winter White Family Photo Christmas Tree!! I am SO excited to decorate for Christmas. So when Michael’s contacted me and asked if I might want to design a tree for their tree challenge, I thought it would be SO fun. Michael’s sent me a pre-lit 6-foot tree and a gift card and I headed over to the store to see what I could find. They have three different collections that they put together for the 2012 holidays. My favorite was the Crystal Elegance Collection. I LOVE that they based some of the collection off of a trip the design staff took to London. They travel around the world to look at trends and colors and use what they find to make the new collections for each year. SO cool!! 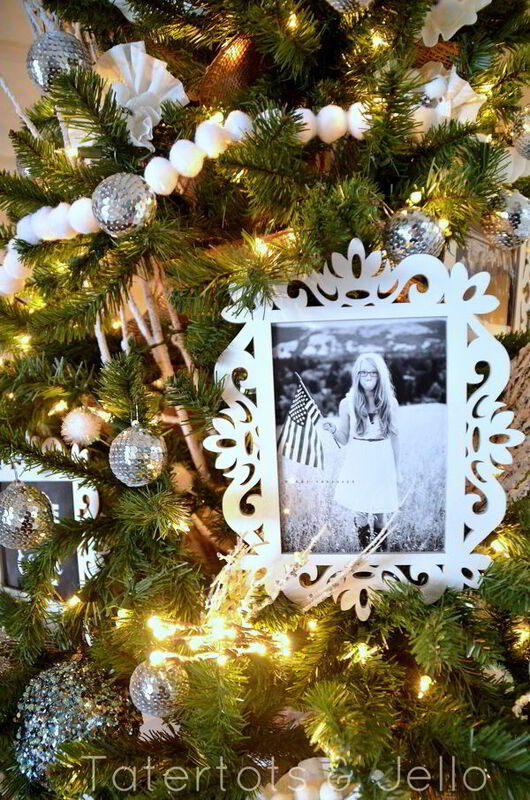 To make the photo ornaments, I took our family pictures and printed them out in black and white. Then I spray painted the frames. I cut out a piece of posterboard the same size as the frames and them taped the picture inside of the frame, with a piece of posterboard behind it to secure it. Then I placed the pictures throughout the tree. (printable from Poppy Seed Projects.) Thanks to my sister for the photos she took of us. 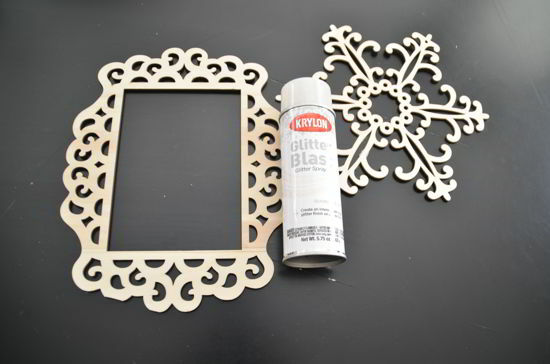 I also took a larger sized frame and spraypainted a piece of plywood with chalkboard paint. Then I put the chalkboard plywood behind the frame and attached it with ducktape. I looped some ribbon through the holes at the top of the frame and hung it on the wall with a Command Hook. 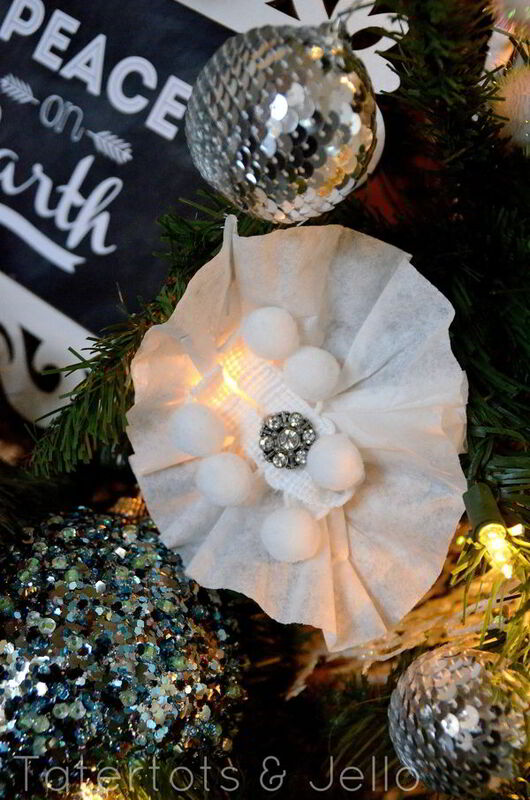 I also made some ornaments using coffee filters and some jewelry brooches from Michael’s jewelry aisle. A tutorial for those is coming up soon. I put the tree in a crate that I found in the unfinished wood area, and then I stenciled and painted the crate and added wheels to the bottom. 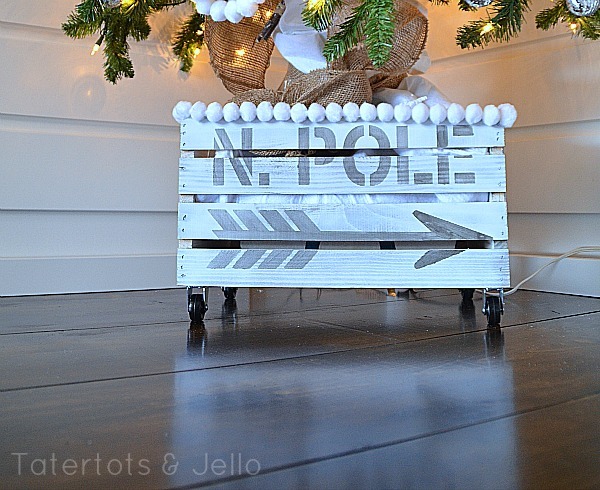 I love using this as an alternative to a tree skirt. So now I have a cute tree for the season. And I love that I can look at it and see my family and some of the things we have done in 2012 together. There are a few other bloggers who also took the tree challenge. I can’t wait to see ALL of the trees and the great ideas!! You can check ALL of the trees out on Michael’s Facebook page and they have a FUN Pinterest page set up for this challenge too – with tons of great tree decorating ideas. Hope over and be inspired for Holiday tree decorating!! PS — I have a really exciting giveaway going on right now!! Be sure to enter to win a Silhouette Portrait!! It’s a BRAND NEW addition to the Silhouette family. I’m so excited to be giving one of the first ones away — the giveaway ends on Friday. HAPPY Holidays — Sweet Potato Soufflé! HAPPY Holidays – Printable Doodle Mats! wa, gray and white are quite great. Thanks for taking part in the challenge and sharing your work! 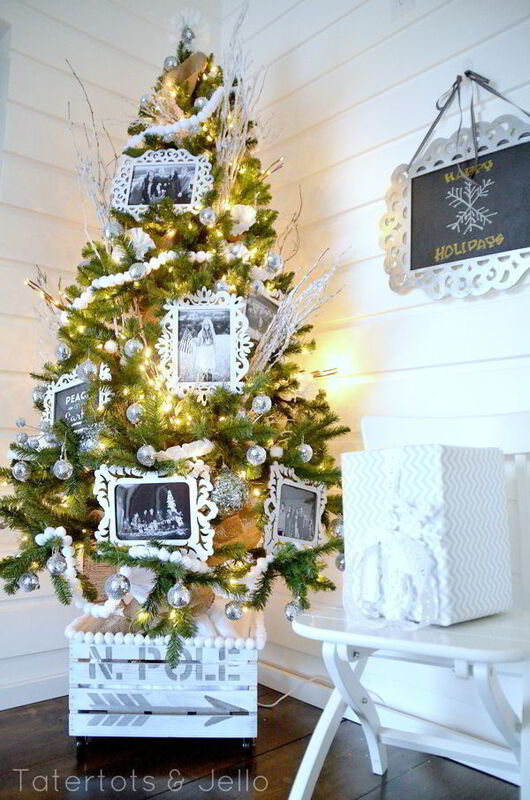 So, I just spent my lunch hour buying everything to replicate this tree, but i’m having a hard time finding a tree with a stand that fits in the crate. What am I missing? great tree! i want to steal it. Love it! It’s gorgeous. Did you make the garland? If so how? 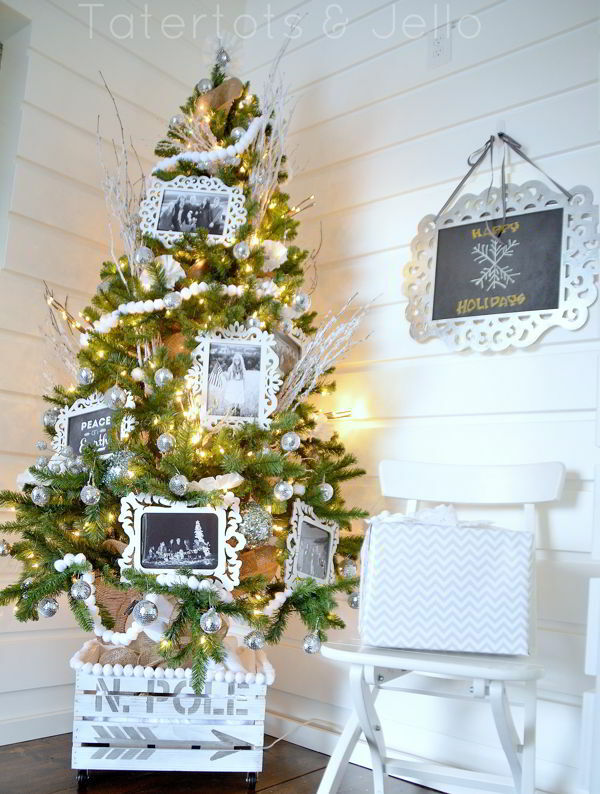 What a great idea to decorate with family photos! Love this idea!!! I LOVE THIS!!! I just searched pinterest forever trying to find this, knowing that I had seen it somewhere. Just beautiful. Thanks for the inspiration! Jen, this is simply stunning!! I had no idea Michaels carries such cute frames. Love them. Your tree is just beautiful. Hope you’re doing well. It’s been crazy around here…haven’t been able to comment on my favorite blogs lately! Amanda!! Thanks for the sweet comment. I have been out of town without internet for the past week. I am so behind lol. I hope things are going well for you and you are getting excited about the holidays!! I love that what did you use for the silver paint? 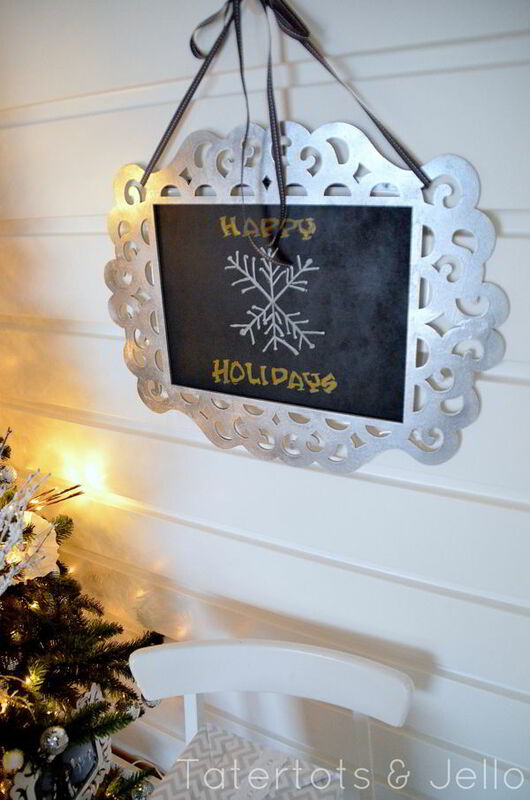 I used Martha Stewart metallic paint for the stencilling. They have a silver metallic paint that is so pretty! You can find it at Michaels. Thanks Anna!! I really love that crate. I am thinking of making a few more for the holidays. I love this time of year!! Thanks Angie!! Yes, we had a wonderful Thanksgiving. I hope you did too!! Okay so that is seriously the coolest tree ever I love the that you put it in the crate. Thanks Lisa!! I love that I can roll it around the house lol. It really is fun! The tree is BEAUTIFUL!! 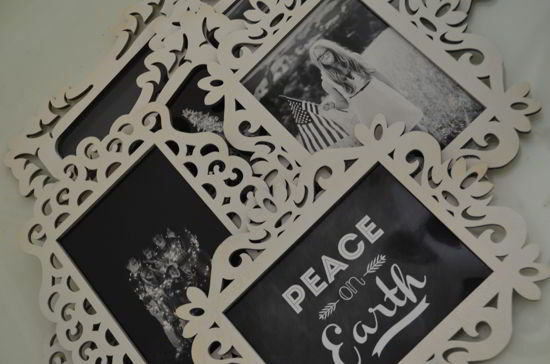 I love the frames with the chalkboard paint message. You did a wonderful job!! Thanks for leaving the sweet comment. Merry Christmas!! Looks great! I love how the frames turned out! I love those frames they sell at Michaels. I can’t wait to make something for Valentine’s Day with them too!! Happy Holidays!! Mimi!! Thanks my friend. I hope you had a wonderful Thanksgiving and are getting ready for an awesome Christmas!! I love this idea!!!! It’s so pretty too. Thanks so much!! I love looking at the tree and seeing all of the fun pictures of our family from 2012. So fun!! Merry Christmas! !